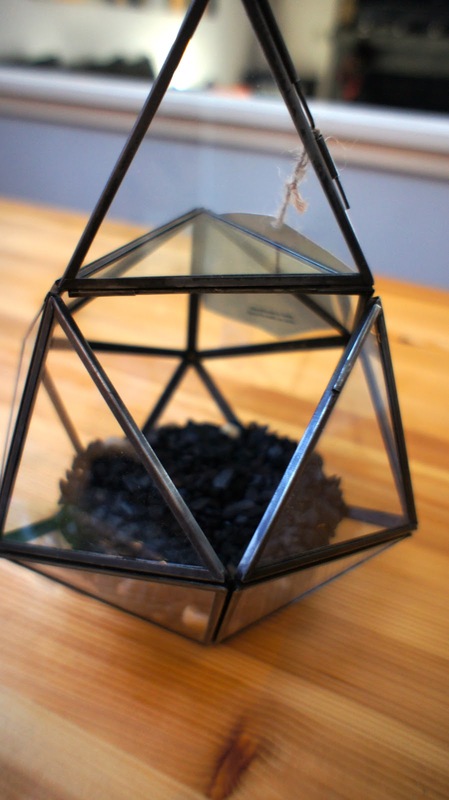 I bought this terrarium from Urban Outfitters online on a whim. I was purchasing a mirrored initial letter for my entry way wall (post to come) and bacon floss for my husbands holiday stocking stuffer when I stumbled upon it. I had some sort of percentage off the purchase and it was free shipping so I wanted to check it out. If I didn't like it I would go to the local store and return it. Well, I liked it and this is what I did with it. I love the shape of this terrarium, but there were a few problems immediately. One- The corners did not meet and that would not only be an issue with watering, but also with the soil. So, my husband got out his clear caulking and took care of that. I taped off the corners with blue painters tape and filled them in. Two- The other problem was that the opening that you use is quite small. My hands aren't the largest so I could get them in there and do what I needed, but I did poke myself with the cactus spines a few times. You might need to use a spoon towards the end. Once the caulking was dry, I was able to get going on this project. I bought all my supplies from the local gardening store and from Home Depot. 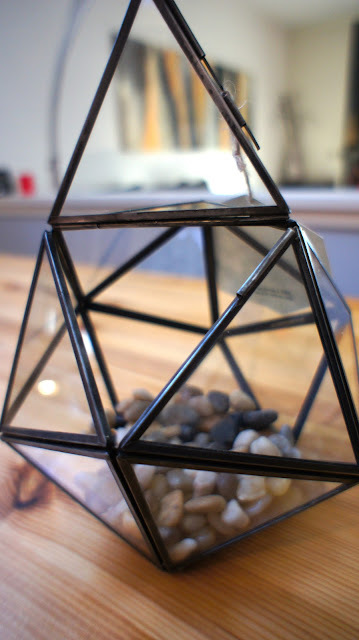 The local gardening store had a whole section set up to make your own terrarium and it wasn’t overly expensive. The charcoal went for $4 and the potting soil went for $5. I also got some moss for $3. I actually bought the plants from Home Depot for a total of 10 bucks. I already had the river stone at home left over from my other indoor plants. The plants were slightly more expensive at the garden store, but I am nervous that the ones I bought from HD might not last. Time will tell. First, I put in some of the river stones to cover the bottom. Cover the stones with charcoal and then a layer of the potting soil. Then put in the succulents, cactus and more soil. Next, arrange the moss and more of the stones. Making it Lovely explains it in a bit more detailed than I did. 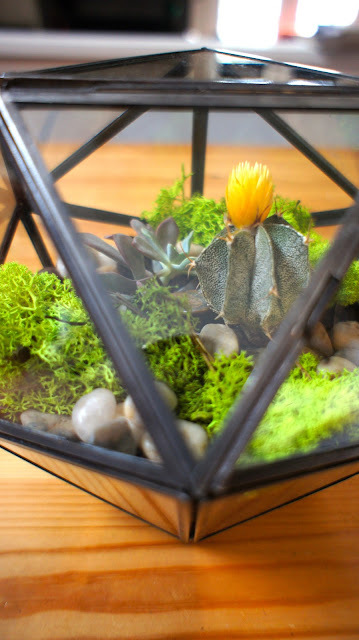 I really like the way she used the tall terrarium and the billy buttons. She didn't use succulents for this terrarium, but I still love the way it turned out. Warning, make sure you do not put the plants too close to the sides or you might have a mold problem in a few weeks. I watered the plants, but will not water them again until they get really dry again. Set up by a window that gets a lot of sun. Enjoy. Labels: Decor., DIY., Gifts., Home., Plants.